It’s all quiet in my house on a Monday night and my husband is nowhere to be found. I look in the kitchen, the bedroom and then wait. It hits me. Just when I realize he is downstairs in his man cave, I hear, “Get the ball – hustle!! !” Ah yes, it’s football season. The time of year where we lose our male loved ones to a sports bar and plates of nachos and wings. So when the following Monday came around, I decided that it was time to join in and experience what this world was like. To do that, we went to Varsity Sports Café and Roman Coin Pizza at their new Midtown location. Between the array of televisions on a wall, there is truly not a bad seat in the house to watch a game. Plus, on multiple game days, they each offer a different option to watch so you can be sure to get all your scores in real time. We decided to sit in a booth set off from the bar but still visible to the televisions. The noise wasn’t too loud there and there was more room to sit. Seeing that it is football season and all, we ordered the hot wings to start off the meal. They arrived dripping with sauce – just the way I like them. The outside was crispy and full of flavor, and the inside was cooked perfectly and marinated by the spicy sauce. We chose the original and hot wings flavors, but other options include teriyaki, bbq, garlic parmesan and Thai. It was bar food at its best – and I loved it. I don’t want a fancy meal when I’m watching sports – I want wings that tingle my tongue and make me lick my lips over and over again. After finishing the wings, we moved on to the pizza and sandwiches. We ordered a classic cheese and pepperoni hand-tossed pizza and were thrilled when the bottom was a bit charred and the cheese on was a lovely hue of orange, red and brown. I like my pizza a bit on the overcooked side and they read my mind perfectly. The pizza was light, flavorful and closer to a New York pizza than a lot of other establishments claim to be. I was happy with the pizza. Was it the best I have ever had? No, but I felt satisfied and willing to order it again. Being a New Yorker, that’s a big compliment. However, I can’t say the same for the sandwiches. I was intrigued by a sandwich called the Chicken Cordon Blue sandwich and unfortunately, my expectations weren’t met. It tasted bland and the piece of ham put on the sandwich was so thick that it was difficult to bite into without the entire piece falling out of the sandwich. The chicken was a bit overcooked, but I must say, the curly fries saved the day. I couldn’t stop popping them in my mouth. I also tried the Philly Cheesesteak, which although they toasted the bun (a hidden gem), it still didn’t offer any taste worth remembering. The cheese flavor was so mild that you felt as if you were just eating dry meat. A bit of marinara sauce on it would have gone a long way. 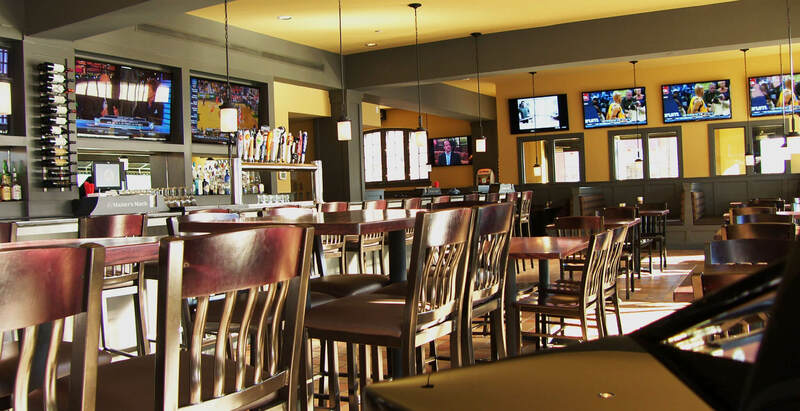 If you are going to Varsity Sports Bar and Roman Coin Pizza, watch a game, grab some wings and order a pizza – that’s the way to watch football anyway. Especially if you want to catch a Monday night game – they run a great special where you get one large single topping pizza, one appetizer and one pitcher of Bud or Bud Light for just $22.49. However, I wouldn’t go looking beyond the bar menu for options – stick to the basics and you won’t be sorry.